This is a relaxed highlights tour of central Madrid that takes you to its finest sights in half a day. You’ll enjoy early entrance to the Royal Palace, exploring Madrid’s answer to Versailles a full hour before the general entrance crowds. Next, you’ll take a city stroll through two historic neighborhoods, stopping at landmark attractions like the Plaza Mayor and learning about the long history of the city, from its roots as an Islamic outpost to its heyday as the heart of a world-conquering empire. A highlight is the visit to one of Madrid’s oldest markets to taste wine, cheese, and iberian ham before ending the day atop one of the city’s best and most exclusive panoramic viewpoints. Meet your guide in the beautiful Plaza Oriente and enter the Royal Palace an hour before the general public. This jaw-dropping building is one of the most luxurious palaces in Europe, much of it built with wealth that came from Spain’s conquest of the Americas. Inside, you’ll see opulent interiors and beautiful works of art by the Spanish masters while learning from your expert guide about the powerful dynasties that once called the Palace home. The best part is that it will be almost empty, with only a few other groups inside. Leave the palace and step into the Barrio de la Morería to learn about Madrid’s Islamic heritage. Then enter the famous Mercado de la Cebada for wine tastings with cheese, olive oil, and world-famous Iberian ham at our favorite food stall. Madrid sits at the heart of one of Europe’s most food-obsessed countries, so this is a great opportunity to indulge in some local treats. Afterward, explore the streets of central Madrid, which are dripping with medieval character. This area is full of stories and historic landmarks, like the Plaza Mayor where heretics were once burned at the stake, and the Puerta del Sol which has become the focal point for celebrations and demonstrations in the modern city. 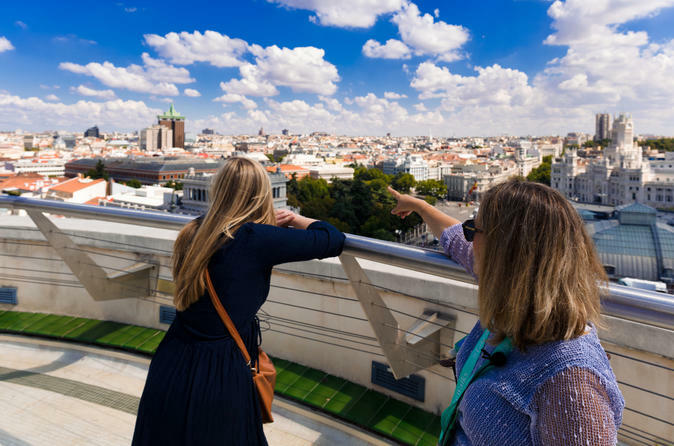 End on the exclusive rooftop terrace of the Circulo de Bellas Artes, which has spectacular views over the entire city. Your guide will point out the different neighborhoods of the city and give you plenty of recommendations for what to see, do, and eat during the rest of your stay.